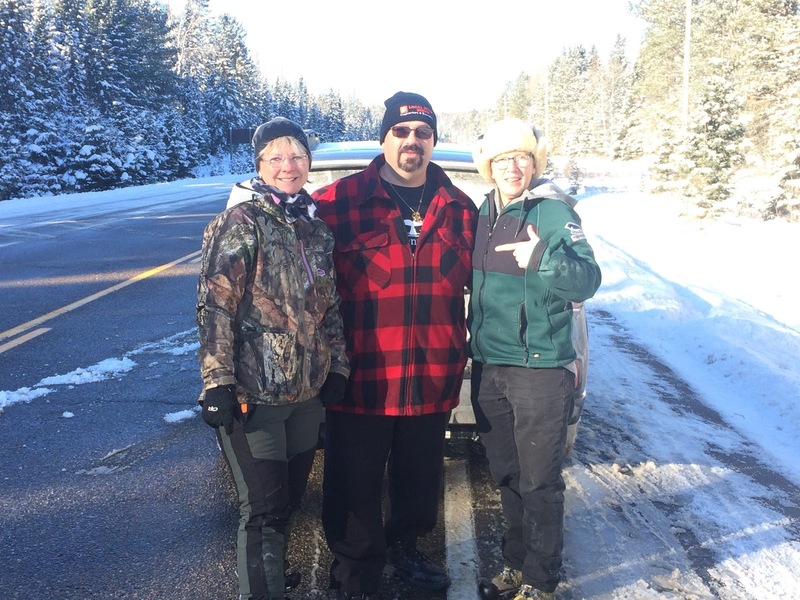 Todd and I headed northwest to Algonquin Park in Ontario in search of winter birds and mammals. Once we entered the park's East Gate, we saw a big sign for Moose crossing. Of course, Todd wanted to get a photo for his sign collection. An easy task except that the side of the road was icy and sloped. Yup. We went into the ditch. Barely but that is all it took to get us hopelessly stuck. Todd isn't happy. 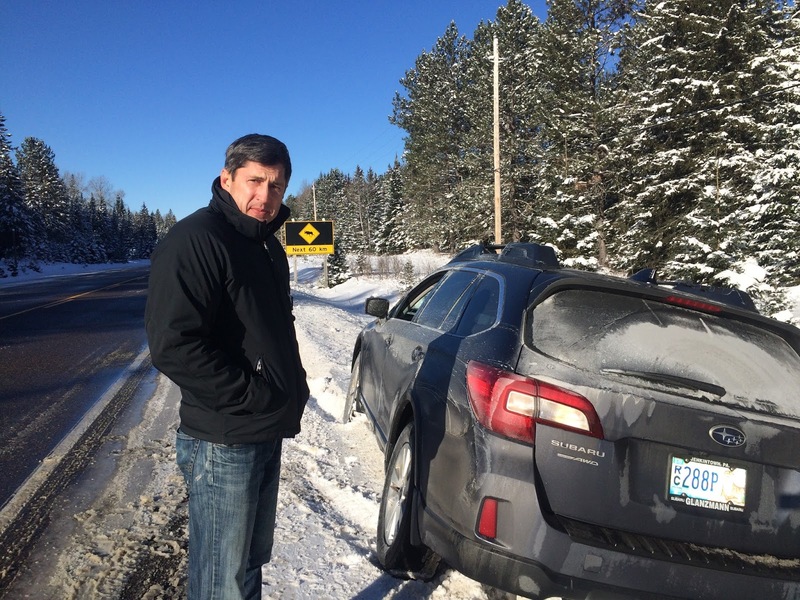 Lucky for us this happened in Canada where everyone is sickeningly nice. A lady stopped right away and offered to go to the gas station outside the park and ask for a tow. 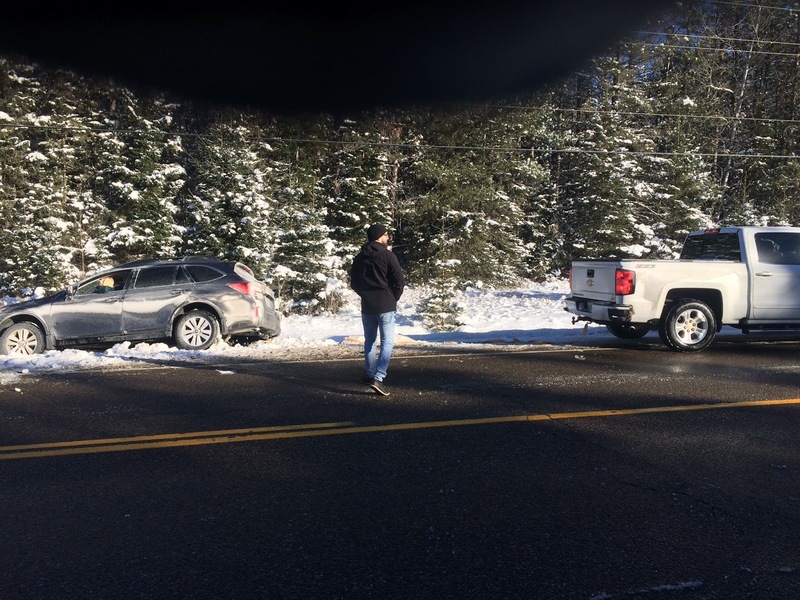 About a dozen other cars stopped too. By the time the lady got back, another good samaritan with a big pickup truck was already pulling our car out of the ditch. Here I am with both of the nice people who helped. The lady turned out to be a wildlife photographer too. The man was on his way to his daughter's house to celebrate early Christmas. Thanks to all who helped. And off we went to explore Algonquin park. 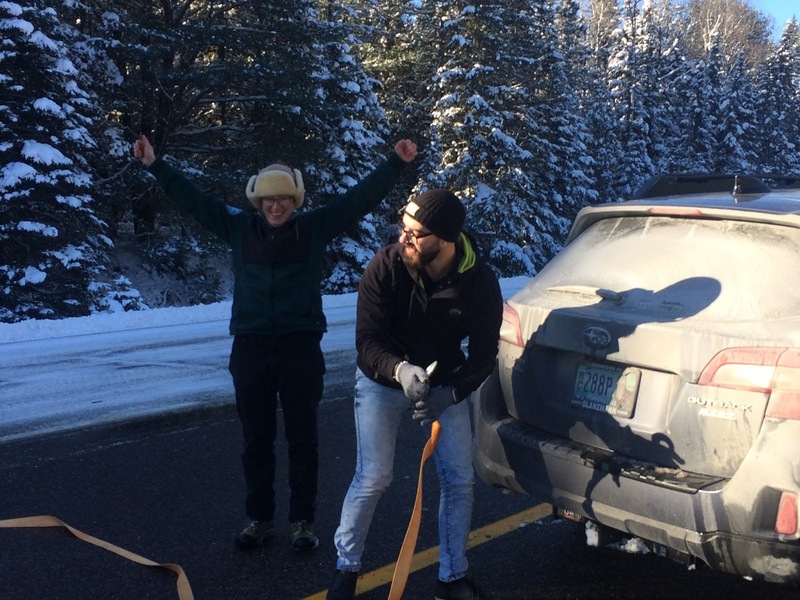 Only one road is open in winter which stretches east to west about 40 miles. We stopped in at the Visitor Center to ask about any wildlife sightings. 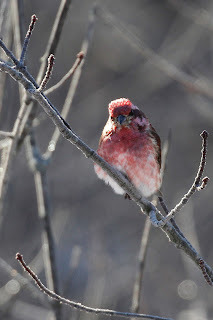 We were rewarded with a few good birds like Purple Finch. 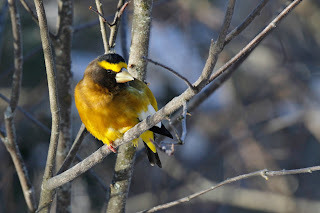 And this Evening Grosbeak. Such rich colors. There are 2 types of crossills in the park - Red and White-winged. 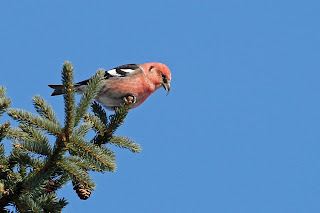 We heard and saw many of both species. 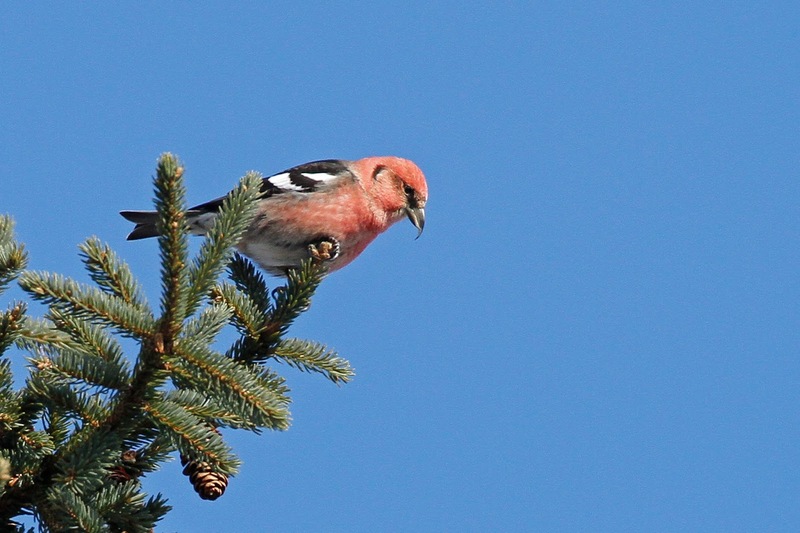 Here is a shot of White-winged Crossbill that shows how the bill actually crosses. 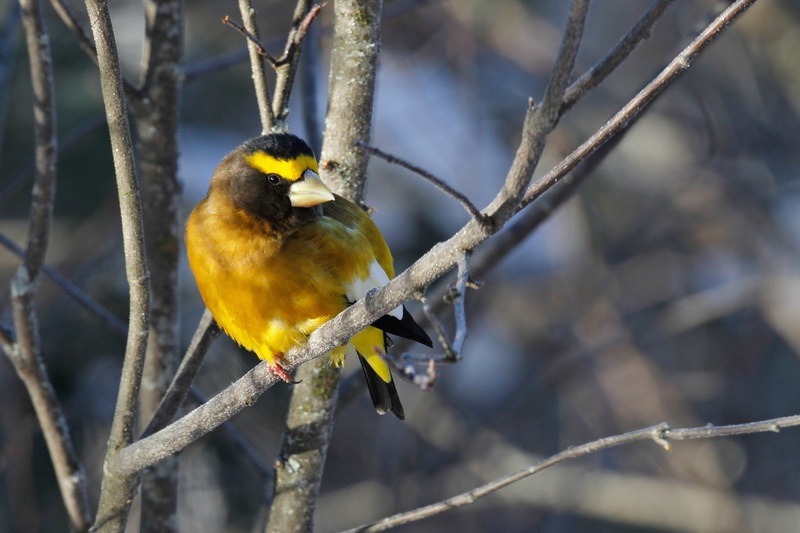 These birds use their bills to unlock seeds from pine cones. Our hotel was on the west side of the park so we headed out after a long day. Oh, in case you were wondering, Todd did take a photo of the sign . . .